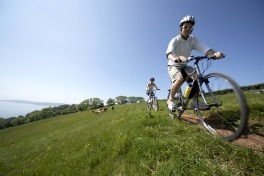 The South Devon area offers some great cycle trails where quiet, narrow lanes weave through lush green valleys, providing opportunities to discover many highlights not seen from the road. The English Riviera provides a good base to work from with "cycle friendly" routes out from the resort in addition to many off-road tracks through Cockington Village and local woodland. Off-road and mountain bike tracks are also close by with Haldon Forest and Dartmoor within easy reach by car. With an ever-expanding link to the National Cycle Route and further links planned, now is the ideal time to explore on two wheels all that our area has to offer! So, for an energetic day out, the undulating landscape of the Geopark can be explored on two wheels. Pop into one of our Tourist Information Centres and pick up a list of the hire shops in the area or go direct to Simply the Bike in Torquay. Tel: 01803 200024. Contained cycle trails exist at Cockington Country Park.